I was in a bookstore last weekend--just browsing, of course. 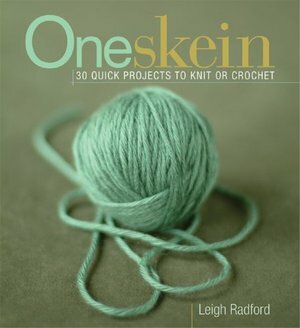 But I did manage to walk away with just one book (hey--I was impressed), and fittingly it was One Skein, by Leigh Radford (author of Alterknits...still on my wish list). I seem to have a short attention span with my knitting projects these days (currently, I have five going, all of which I rotate getting bored with and moving onto another...this is a big shift from my former start-to-finish kind of knitting style. Hmn. ), and so of course this book really, really appealed to me. Or, it could have just been the amazing colors chosen for the book cover. Yummy, no? 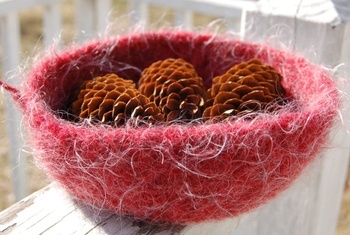 I wanted to make something right away, and the felted bowls were calling to me most of all. 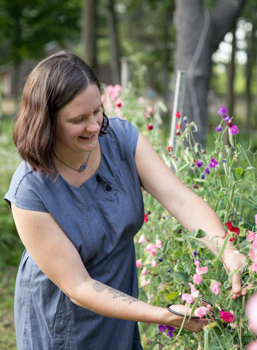 Here's mine, using stash leftovers of Lamb's Pride bulky. I see many, many, many more of these in my future. So fast, so seamless, and so satisfying.